Susie Isaacs came prepared with memorable quotes from some very noteworthy bookworms. Isaacs, the librarian at Sunrise Elementary School, addressed a group of about 30 young readers on a recent Friday morning. The assembled fourth- and fifth-graders were all members of the school’s Newbery Club, a group dedicated to reading, discussing and recognizing eligible entries for this year’s Newbery Award, America’s premiere prize for children’s literature. Before the students took turns talking about their favorite recent reads, Isaacs offered pithy quotes that hinted at the core mission of the club, which started last year with some financial help from a Cherry Creek Schools Foundation grant. Isaacs offered insights from Oscar Wilde about the value of a memorable book before moving on to a quote from author and educator Mortimer J. Adler. Judging from the students’ enthusiastic and impassioned presentations, plenty of potential Newbery Award nominees had already met that criteria. 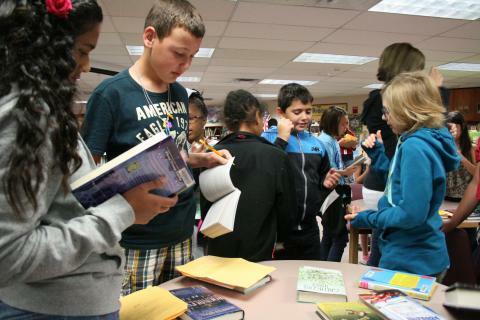 The Sunrise readers who reported to school an hour early raved about their favorite selections and argued about which book was worthy of this year’s Newbery Award. Fifth-grader Natalia Evans’ words came rapidly as she praised “A Snicker of Magic,” a fantasy novel by Tennessee author Natalie Lloyd. For Isaac, such testimonials prove the school’s Newbery Club is fulfilling its mission. She first came up with the idea for the organization last year after meeting a member one of the 15 members of the Newbery Committee. She was intrigued by the process behind the Association for Library Service to Children’s award, which kicked off in 1922 and recognizes “the most distinguished contribution to American literature for children.” Isaac saw the need for more direct feedback from young readers. That’s where an Educator Initiative Grant from the Cherry Creek Schools Foundation came in handy. Funding of about $1,000 gave Isaac and the rest of the Sunrise library crew the resources to connect students with the latest and greatest in children’s literature. The school’s young readers showed plenty of appreciation for the new books. They eagerly attended the early morning meetings of the club; they fiercely debated their favorite selections. On the day the Newbery Committee announced last year’s winner, the school library held the taut air of anticipation. That much was clear as the club members came together to discuss their favorite candidates. Fifth-grader Kiergon Wilkins worked through stacks of hardcover books and pointed out his favorites. He lamented the fact that “The Boundless” by Kenneth Oppel wasn’t eligible for the award (the author lives in Canada), pointing out that the fat volume is “the longest book I’ve ever read.” The day before fall break, Wilkins had several books he planned on tackling during his vacation. Along with his fellow club members, he looked forward to earning more “charms,” small plastic pieces readers wore on necklaces to signify every book finished; enough charms would earn a club member the coveted “book worm” medal. Those tokens will come in handy by January, when the students decide their final pick for the most worthy book and send their selection off to the Newbery Committee. Whether they end up choosing the same winner as the committee or not, the students will have served a noble and valuable purpose.